This shrinkage ring is for enforcing shrinkage cracking with controlled surface drying. For testing early cracking special shrinkage castings are used. This casting is formed like rings with an outer diameter of 590 mm an inner diameter of 280 mm and a height of 40 mm. On the outer ring 12 rips are mounted. This rings are fixed on a ground plate. After filling in the fresh concrete a ventilation unit is set onto the rings with a distance of 10 mm. 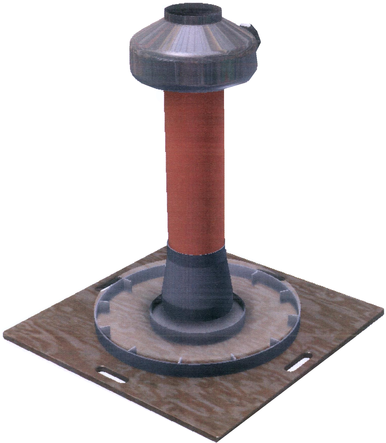 This ventilation ring is made of a round PMMA lid, a valve, and a speed controlled fan with a power of about 500 m³/hour. The weight loss, the flow speed of the air and the temperature inside the concrete is measured. Also air temperature and air humidity are recorded. This setup is based on a suggestion of the Norwegian Forskninginstituttet for Cement og Betong, Trondheim. Häußler, Franz: "Frühschwinden von Faserbetonen" (Early Shrinkage of Fibre Concrete), Diploma thesis (German), University Innsbruck, 2001, supvervised by Prof. Dipl.-Ing. Dr. techn. habil. Wolfgang Kusterle.